This title was first published in 2001: For over 30 years it has been argued that contemporary society is undergoing a fundamental transformation. The portrait of the modern society or modernity offered by philosophers and social scientists from Hobbes to Parsons is no longer understood as a description of the final and highest stage in the social evolution of mankind. Modern society is not the end of history but simply another more or less contingent social and cultural formation on planet earth. 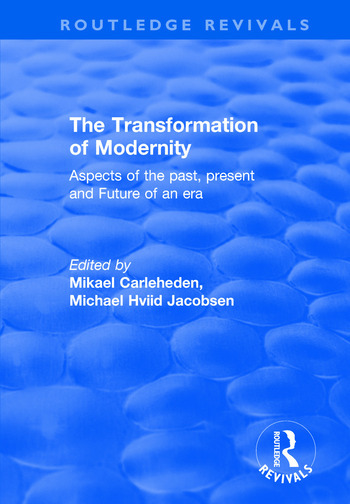 This new perspective on modernity and its transformation, which has emerged from the modernist-postmodernist debate, is the subject matter of this book. It is addressed in a multidisciplinary and international way, both theoretically and empirically, and is explored not only in general and historical terms, but also through specific topics such as sexuality, identity, democracy, globalization, knowledge and leadership. Offering an important collaborative contribution to contemporary discourse in sociology, social psychology, politics and philosophy, this book represents a unique effort to come to grips with our obscure and elusive social position at the start of the 21st century. Contents: Introduction, Mikael Carleheden and Michael Hviid Jacobsen. General Aspects: Time-consciousness and transformation: on modernity’s relation to the future, Nikolas Kompridis; From industrial modernity to risk modernity? a critical discussion of the theory of risk society, Klaus Rasborg; Early reflective modernity: the differentiation of political reflexivity, Gorm Harste; Modernity and its archive: the principle of insufficient reason, Bo Isenberg; Rethinking the Epochs of Western modernity, Mikael Carleheden. Identity, Sexuality and the Intimate Sphere: Modern and postmodern themes in American sexual politics, Steven Seidman; Private sexuality, public morality and modern sexology: what prospects of sexuality in times of uncertainty?, Michael Hviid Jacobsen; If people believe ideas are real...: women’s self-perception as active individuals in late modernity, Catharina Juul Kristensen; Transformations of identities in rapidly changing societies, Lars Dencik. Globalization, Knowledge and Democracy: Global society as the crisis of democracy, Hauke Brunkhorst; Professions on the road to global power: the case of the legal profession, Margareta Bertilsson; Modern reflexive leadership, Ojvind Larsen; Contributors; Index.